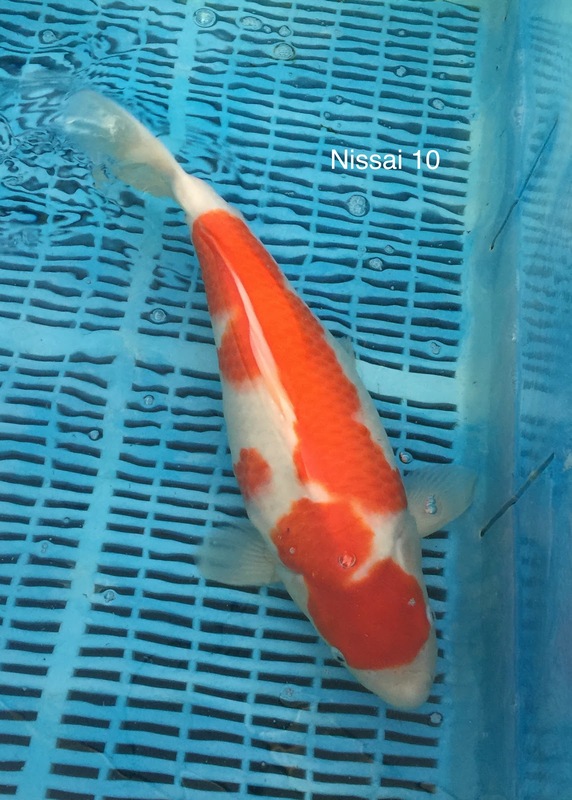 There's a lot more happening in the development with this July 14 spawned kohaku, than we saw in the last case study (#6); and this one also delivered more show success too - placing well at the South of England koi show in June. I've observed on several of ,my home bred kohaku's - from both of last year's spawnings, that gaps between the hi plates can be filled with the hi expanding into them. On others, the hi seems more stable position wise; it might even receded a bit, or expand a bit in specific areas. When I was in Japan, I put these observations to Shintaro san during a 1-2-1, and he commented that it was simply 2 different types of red; he said some reds expand, some contract - and that neither was better than the other, simply that they were different and that depending on the individual koi, the pattern could be made better or worse through the change. This is a trend to keep an eye on, and it may take a few years before I can draw some conclusions on it; for now though, I will not be using the expensing or contracting characteristic as a selection critera. The koi that is the subject of this case study is an example of the expanding type of hi. 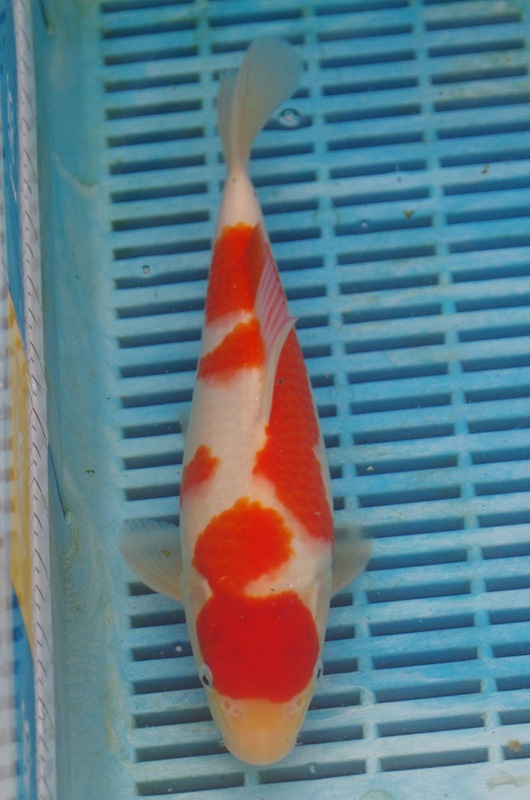 This is the earliest picture I have of this koi, taken 16/1/15; at which point it is 6 months old. 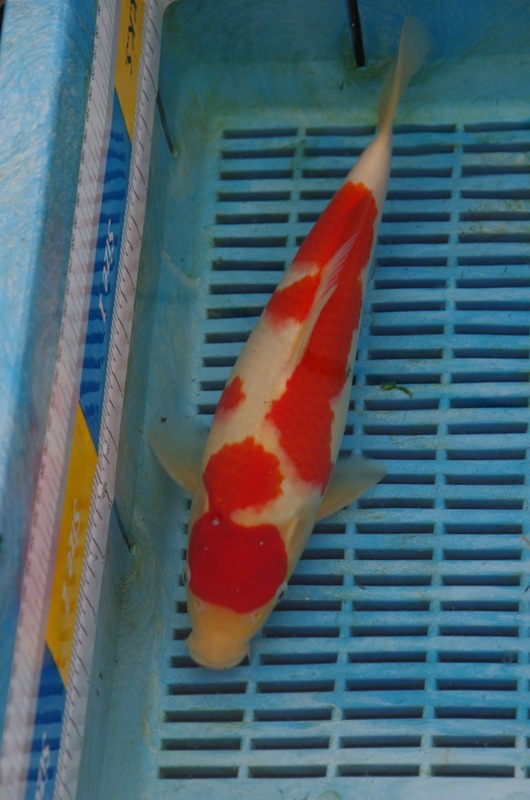 At this early stage, I remember that compared to it's peers - this was a smaller than average koi, but the red colour was in the top few for being consistent, neat and lustrous. At this point, I'm feeling pretty happy with the way the koi is developing. I've not noticed the expanding hi, because to be honest, it hasnt affected the pattern to much. It's only now as I write up the study and have knowledge of how the koi looks now (see later photos), where I've noticed the gaps at points A and B are closing up - and particularly the one at point B, I'd much prefer the gap to remain. At this stage in it's development, I'd really like the gaps to stay open. Here's a pic of it at the South of England koi show, which takes place in the first weekend of June - and in 2015, that was the 6th and 7th June. 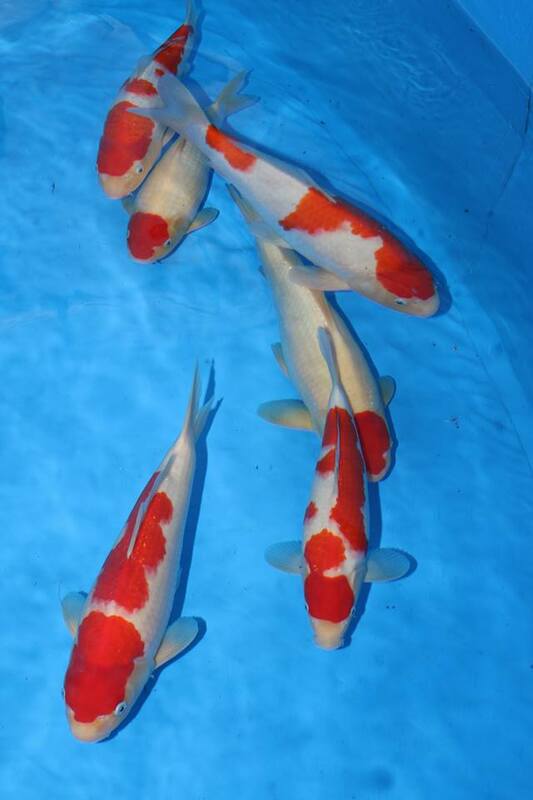 It did fantastically well at the show, coming 2nd in size 2 kohaku and 3rd overall in size 2, which was out of 36 koi. And I believe it also placed 3rd in the running for baby champ - and that was out of 80 koi. 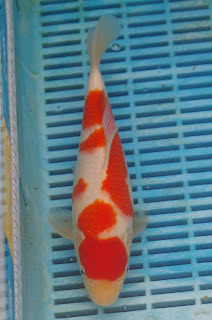 So, a great result with a home bred koi. On the 17th July 15, I have a measurement of it at 34cm when it was benched into the East of England show; where it didnt place. I don't have a decent pic of it from that time to present, but it's useful to have the measurement. And here's the most recent photo, taken on the weekend of 21st / 22nd November. You can see the red at both points A and B is closing up the white gap! And, I'm not particualrly happy about it, especially around point B. On the upside, as it stands right now - the white on this fish is that best out of all the koi from that spawning. 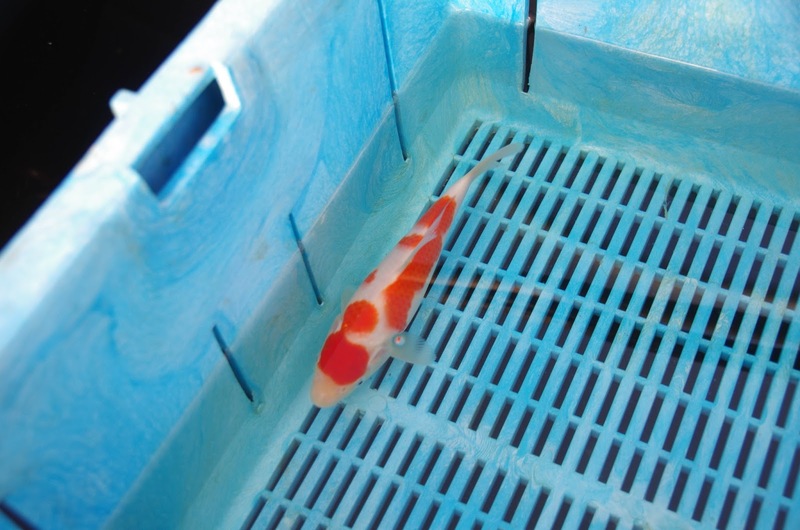 It's easy to spot when they're all in the tank together - and the white on the nose is much whiter than it's peers - only one other koi from that spawning comes close on the whiteness front; and that will be the subject of a separate case study. The body is filling out nicely, and that's another plus. But the other downside is that the kiwa is becoming a bit less clear. very noticeable when looking at the koi close up in the bowl - and this is actually the most worrying development trait as things stand currently. 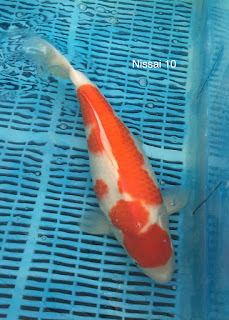 We took some video that same weekend, which also helps as part of the record of this koi - and it's easier to see how the hi at point A and B are closing up.